Today is Cinco de Mayo! Cinco de Mayo commemorates the Mexican army's unlikely defeat of French forces at the Battle of Puebla on May 5, 1862. While Cinco de Mayo has limited significance nationwide in Mexico, the date is observed in the United States and other locations around the world as a celebration of Mexican heritage and pride. In Mexico, Cinco de Mayo is a "voluntary holiday." I heartily volunteer to celebrate it with these delicious enchiladas. I saw this recipe on Sweet Pea's blog and I knew I would have to try it. I've tried "other" enchilada recipes before, and have never been very happy with the result. That has now changed. These are the best enchiladas I have ever made, and they rank right up there with the best RESTAURANT enchiladas! 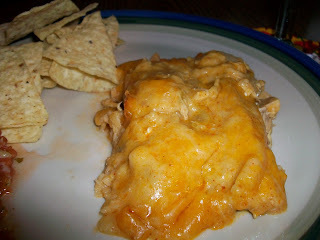 I am so excited to have found such a great enchilada recipe to make at home! Start by sauteeing the onions in butter. 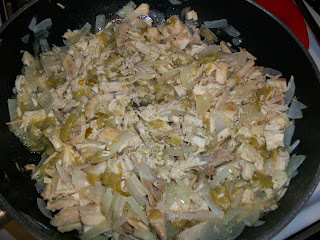 Once they're soft, add the cooked chicken and diced chiles and stir well to combine. I used chicken that was left over from the crock pot roasted chicken. Next, make the sauce. This is just another version of the famous white sauce! 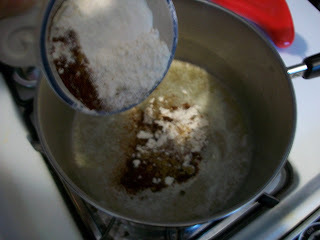 Melt the butter, add the flour and spices and stir and cook til bubbly. Next, add the chicken broth. If you've roasted a chicken, you can use part of the drippings from that in place of some of the broth. Cook and stir until the mixture comes to a boil and starts to thicken a bit. 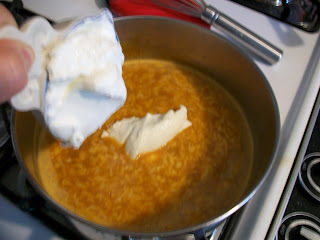 Remove from the heat and add the sour cream and 1/2 cup of the cheese. 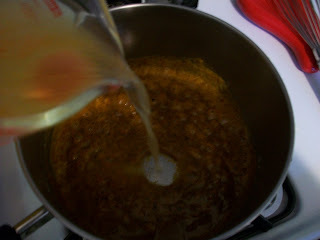 Stir well to incorporate the sour cream, and then add at least a cup of sauce to the meat mixture. Then, get ready to fill the tortillas! I prefer corn tortillas, for both taste and nutritional value. However, straight from the fridge, they are very difficult to work with, and they will break apart if you try to roll them. You can microwave them to soften them, or fry them a bit in oil. I get good results by heating a skillet with 1/2 inch of water to boiling, then dipping the tortilla in for 3 seconds to soften it. Don't leave it in longer, or it will get TOO soft! Lift it out with a slotted spatula and let the water drip off a bit. 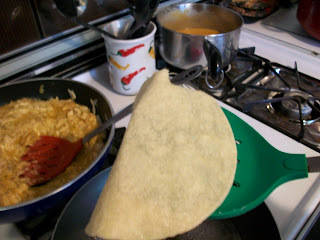 I then put the tortilla on a small plate, and put the filling down the middle. Bring the sides together to roll up. 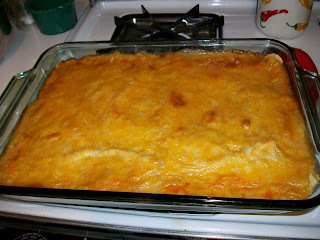 If you're lucky, you can carefully lift the enchilada with your hands and place it in a 9x13 baking dish. 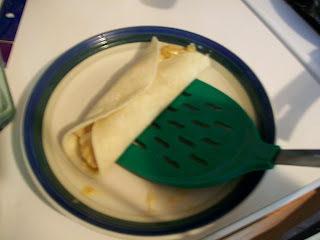 I was able to do some that way - the others I lifted carefully with the spatula and then turned over into the dish. 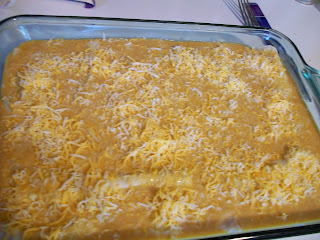 Cover the enchiladas with the remaining sauce, and then sprinkle with the cheese. 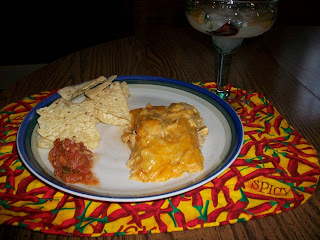 The recipe calls for Monterey Jack - I used a Mexican blend and it was very good. Use what you have! Bake, uncovered, for about 25 minutes. The sauce and cheese will be really bubbly. Let it stand for about 5 minutes before serving. I posted this as my favorite recipe ever at the Ultimate Recipe Swap. Head over there to find more great ideas! Melt 2 Tbsp. butter and cook onions until softened, then turn off the heat. Add chicken and green chilies, stir well. Set aside. Melt remaining butter. Blend in flour and seasonings and stir until bubbly. Whisk in chicken broth. Cook, stirring constantly, until sauce boils and begins to thicken. Remove from the heat. Stir in sour cream and 1/2 cup of the cheese. Stir 1 cup of sauce into the chicken mixture. 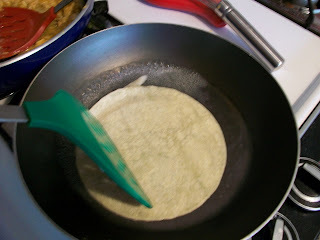 Soften tortillas in microwave or by dipping in a skillet of boiling water. 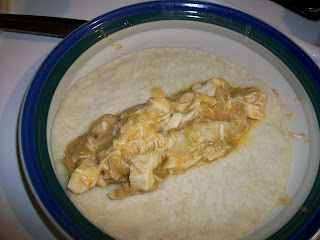 Spoon chicken mixture into tortillas and roll up. Place in 9×13 pan. Top with remaining sauce and cheese. Bake uncovered at 350 for about 25 minutes. So glad you tried them. Yes they are so good, we love this recipe!! And I love to use my sticky chicken recipe, which is very similar to your crock pot chicken. Yep, it is a GREAT recipe. I just made this recipe for our church LifeGroup on Sunday. They loved it. I love NEWLYWEDS blog. There is always something yummy. Thanks for sharing your version of it! Looks wonderful! I'll have to give this a try! Thanks for sharing. This looks fantastic. Thanks for sharing it.